Despite the fact that Meghan Markle and Prince Harry have seemingly barely sat down during the last few months ‚ hello, NYC baby shower and 16-day royal tour! — the Duchess of Sussex plans to take a step back from the limelight to prepare for her April due date. Continue reading When Will Meghan Markle Start Maternity Leave? Posted on March 12, 2019 Author khurramCategories Celebrity GossipLeave a comment on When Will Meghan Markle Start Maternity Leave? More than 50 former wrestlers and performers have filed suit against the WWE, claiming that it hid the risk of brain trauma and failed to provide wrestlers with necessary medical attention and support. The wrestlers, who include Jimmy “Superfly” Snuka, allege that the WWE knew about the potential for brain injury and was not only negligent in its failure to address it, but went so far as to withhold and cover up the risks as well. “WWE placed corporate gain over its wrestlers’ health, safety, and financial security, choosing to leave the plaintiffs severely injured and with no recourse to treat their damaged minds and bodies.” In a statement, the WWE basically says this lawsuit is based on lies and is likely to be thrown out of court. “This is another ridiculous attempt by the same attorney who has previously filed class action lawsuits against WWE, both of which have been dismissed,” the WWE says. “A federal judge has already found that this lawyer made patently false allegations about WWE, and this is more of the same. We’re confident this lawsuit will suffer the same fate as his prior attempts and be dismissed. As the WWE notes, this same law firm has gone after it before without much luck. Its last case was dismissed in March, but Cageside Seats reported at the time that the court left some amount, albeit not much, of an opening for a future lawsuit. That rested on whether the WWE hurt performers by failing to give them information that it should have. This new suit addresses that, claiming that wrestlers’ injuries “were caused by the WWE’s acts and/or omissions.” There’s also a separate piece to this lawsuit where performers claim that they were incorrectly hired as independent contractors, rather than full employees. That’s a big part of the story here and affects whether wrestlers should have received medical protections that would have been afforded to a proper employee. Regardless of the legal avenue, the lawsuit’s intention is to get the WWE to address what the many wresters claim are serious neurological injuries they sustained while performing. “Each of the named plaintiffs as a WWE performer sustained neurological injuries by simply participating in WWE matches,” the suit alleges. Increasingly, we’ve seen former athletes targeting the corporations behind their sports for failing to address health issues they should have known about. Most notably, the NFL has agreed to a $1 billion settlement over concussion lawsuits by former players. Zayn Malik might have just celebrated the release of his debut solo album, but you’d never be able to tell judging by these pictures. The former One Direction star failed to raise a smile when he stepped out in New York on Wednesday. Zayn looked less than happy as he strolled along a Manhattan street dressed in head to toe green. 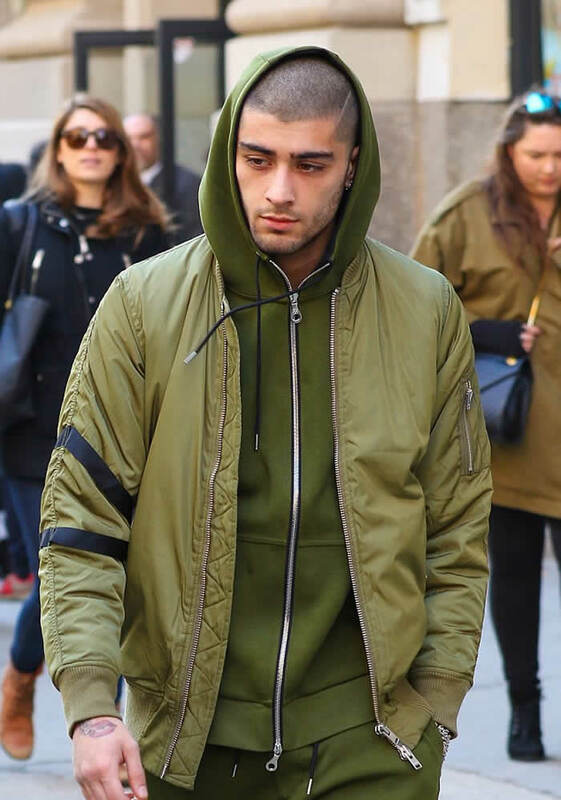 The 23-year-old stood out in a bold olive green tracksuit and light green bomber jacket. The rugged star, who recently released the music video for emotional song It’s You, was also showing off his new shaved do and a lot of stubble. You’d think he’d be able to raise even a small smile given Mind of Mine peaked at number one in 83 countries on the iTunes chart. The 23-year-old singer released his LP last Friday, exactly a year to the day he shocked the world when he quit boy band One Direction. The lead single PiLlOw TalK from the record topped the charts in 60 countries worldwide and he’s now reached yet another mammoth milestone with the success of his album. Despite his glum appearance the singer took to Twitter to thank his fans for all their support and said his dreams are coming true. “Zquad thank you, dreams coming true right now (sic),” he shared with his 18 million followers. A twerking polar bear and a trio of lively lemmings are the main selling points of Lionsgate’s animated feature originally slated for direct-to-video but now receiving a wide theatrical release. Hoping to cash in on this holiday weekend’s absence of kiddie fare — after all, you can’t take little Heather and Tommy to The Revenant — Norm of the North is mildly diverting, although Pixar needn’t be overly concerned. The title character, voiced by Rob Schneider, is a polar bear so sweet that he can’t bring himself to eat seals, although he desperately tries to chase one down in the hyperkinetic opening scene. Norm’s special gift is the ability to “speak human,” which comes increasingly into play with the encroachment of bear-loving tourists and, more dangerously, a villainous billionaire real-estate developer, ironically named Mr. Greene (Ken Jeong), who plans to build luxury condos in the frozen landscape. Alarmed when he finds out about the plan by the arrival of Mr. Greene’s marketing director, Vera (Heather Graham), to shoot a TV commercial, Norm decides that he has to take action. Encouraged by his wise seagull mentor Socrates (Bill Nighy), he stows away with three lemming cohorts on a ship to Manhattan to prevent his homeland from being despoiled. Once there, Norm finds himself a minor celebrity, with jaded New Yorkers assuming he’s an actor in a polar bear suit. He even performs his trademark dance, the “Arctic Shake,” to delighted audiences in Times Square, although unlike the current crop of Elmos, Spider Men, et al, he doesn’t solicit tips. The film doesn’t exactly score points for originality, whether it’s the frequent musical numbers, the indestructible lemmings whose resemblance to Minions is strictly not coincidental or the reliably kid-pleasing bathroom humor, here evidenced by such moments as when the lemmings relieve themselves over a fish tank. As a bone to adults, there’s also a glancing effort to embrace such weighty themes as global warming and conservation. Neither its animation nor voice performances (Colm Meaney and comedian Gabriel Iglesias also lend their talents) are particularly memorable, but Norm of the North, especially in its early section set in the Arctic, has its appealing moments. And if the film does well, those adorable lemmings are going to make for some highly coveted plush toys. The Force Awakens now in UK cinemas, Harrison Ford says he hopes audiences don’t spoil the plot for people who are yet to see the film. Disney asked journalists who saw an early preview to keep the story secret, which most seem to have done. It’s a strategy Han Solo and the rest of the Star Wars cast hopes will work. “I just think it’s great for an audience to go in and have a film experience rather than being told what’s going to happen,” says Harrison. Many of the reviews online this week also tried to keep story details to a minimum. The fans and critics who have already seen the film have mostly been praising it. On Twitter some people have distracted themselves by posting amusing fake spoilers instead. In one joke punchline, Jon Snow from Game of Thrones is revealed as Darth Vader. There is also an Obi Wan Catnobi doing the rounds. Simon Pegg consulted on the script with his friend JJ Abrams, who directed The Force Awakens. He’s in total agreement with Harrison, and wants people who’ve seen it to keep quiet. “These days people are just so quick to ruin films for everyone else just because they can,” says Simon. “And I think it’s really wonderful how people are sticking to the ‘no spoilers’ rule. I find that really heartening. “I think it’s very honourable and it’s a lovely thing.” Thousands of fans have already seen the film on its first day of release, having booked tickets to midnight showings in cinemas across the country.